I’m working with a Raspberry Pi 2 for my final-year project in college. We needed internet connectivity on the Pi, and a friend (and team-member) of mine had a Tata Docomo Photon Max WiFi Data Card. So we decided to put these two together. The data card (3G dongle / WiFi adapter) is actually a Huawei EC315. It can act as a USB modem as well as a WiFi access point. And as it turned out later, it was a near-perfect choice for the Raspberry Pi. I’ll assume that you’re running the latest Raspbian / NOOBs distro on your Pi, and you have completed the initial setup process. First off (if you haven’t done it already) update your package lists. Now plug in the EC315. You should be able to see it listed by lsusb. In the picture, it’s the one that says 12d1:1f01 Huawei Technologies Co., Ltd. But you can’t use it to connect to the internet yet. You can see that running ifconfig won’t turn up the EC315. This is because most data cards these days come with a small on-board memory that contains the necessary drivers to make them work on Windows machines. When you plug them into a Windows machine, this memory is mounted, the required software is installed, and the data card is then ‘switched’ to a ‘modem’ mode that lets Windows recognize it as a USB modem. But on Linux systems, you need a program to ‘switch’ your data card to ‘modem’ mode. usb-modeswitch is a program that does just that. Now unplug the EC315 from the Raspberry Pi, wait a second, and plug it back in. If you run lsusb now, you can see that the device ID of the data card has changed. This is because usb-modeswitch has now switched your data card to ‘modem’ mode. You can also see that the EC315 turns up as an ethernet interface in ifconfig. This is why the EC315 is a near-perfect choice: it works right out of the box with usb-modeswitch, with no additional configuration whatsoever. You can now start surfing right away! An interesting (and convenient) thing to note is that even if you shutdown your Pi and start it up again now, the data card will still be recognized as a modem. This will make life easier if you want your Pi to run unattended. If this doesn’t happen with your data card, then you might need to install a program like wvdial that will let you configure a dial-up connection. For more information about this, take a look at this post of Nico’s, that I started off on. Though just unplugging the data card and plugging it back in worked for me, you might need to restart your Pi if it doesn’t. Supposedly, sudo udevadm trigger emulates a hotplug; but it didn’t work for me. Here’s how I installed and configured Sublime Text 2 on Fedora 22, 64-bit. This should also work for other fairly recent versions of Fedora. For Linux, Sublime Text is available as a tarball which contains a pre-compiled executable. So all you have to do is download, extract and run it. You can download it directly from your web browser, or use the following command to download it from the terminal. Don’t forget to escape the spaces in the file-name with a \ (backslash). Note that if your operating system is 32-bit, you should get the appropriate file. Extract it using your favorite archiving program. Or you can use tar. You may also want to move it to another location, and/or rename it. You can now use Sublime Text to create/edit files. If you run Sublime Text now, you will probably notice that it has no application icon, and that it’s not present in the Applications list. The Exec key should contain the command executed when you click on the application icon. If you added the Sublime Text folder to the PATH, this will be sublime_text. If you symlinked it, for example to /usr/bin/sublime, then use sublime. The Icon directory inside the Sublime Text directory contains icons of various sizes. Choose one that looks neat on your screen. The Icon key contains the path to the image you want to use as the icon. Save this file as sublime.desktop in /usr/share/applications/. Now you will be able to find it in the Applications list. The icon is also displayed. Now that we are set, we are going to make a couple of adjustments to make life easier. On the menu bar, click on Preferences > Settings — Default. This opens a file named Preferences.sublime-settings which contains various options that can be configured by the user. First off, tell Sublime Text to convert tabs to spaces. Search for (Ctrl + F) translate_tabs_to_spaces and set it to true. If you don’t want auto-complete to enter the suggestion when you hit Enter, then search for auto_complete_commit_on_tab and set it to true. Now you can press Tab to enter auto-complete suggestions, and Enter to enter a newline. // By default, auto complete will commit the current completion on enter. // This setting can be used to make it complete on tab instead. // ambiguity between committing the completion and inserting a newline. If you found this useful, or spotted an error, please let me know in the comments 🙂 In a future post, we will see how to set certain file-types (like .php or .py) to open with Sublime Text by default. I recently managed to build a crude water-level controller for my overhead water tank at home (expect a post on how to build yours 🙂 ). Being a newbie, my platform of choice was of course, Arduino. When it came to installing the setup, though, I wanted just a micro-controller, and not a huge board with a USB port. Taking the easy way out, I decided to burn the Arduino bootloader on an ATMega8, and upload the code to it. There is enough documentation on the internet to walk you through every step of the process. So, I will just summarize what worked for me, and provide links to the resources that helped. To burn the bootloader, you need a programmer. The most sensible option seemed to be Usbasp. I didn’t have one, so I used the Arduino as a programmer. An Arduino. I used a derivative called Roboduino, because that was all I could lay my hands on. A crystal of appropriate frequency. A few lengths of wire. A power supply. I cut off the connector at the end of a mobile phone travel adapter, and used it as a DC voltage source. After uploading the ArduinoISP sketch, I connected a 10uF capacitor between RESET and GROUND (also denoted as GND) on the Arduino, because my board was more or less similar to the Arduino Uno. I wired it up exactly as mentioned in the ArduinoISP tutorial. Here is the image for a quick reference. Wiring up the AVR to the Arduino. Go to Tools > Programmer from the menu and select ‘Arduino as ISP’. Go to Tools from the menu again, and click ‘Burn Bootloader’. Now load the program that you want to upload to the ATMega8, in the Arduino IDE. Go to File menu and click ‘Upload using Programmer’. Now it is time for the ATMega8 to man up and deal with the task at hand :). 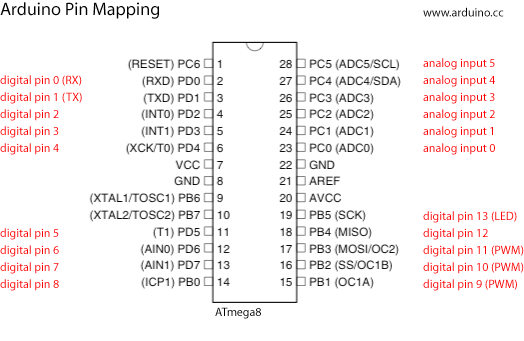 Just remember that the pins on the Arduino do not translate to the corresponding pins on the ATMega8. You will have to search for “Arduino to <insert micro-controller name here> pin mapping” on Google to find out what the pins on the Arduino actually translate to. Here is what it looks like, for the ATMega8. Provide an appropriate power supply, and wire up your circuit as per the pin mapping. I used the same stripped travel adapter for power. I connected pins 7 (VCC), 21 (AREF) and 20 (AVCC) to +5V and pins 8 and 22 to GND (Ground). 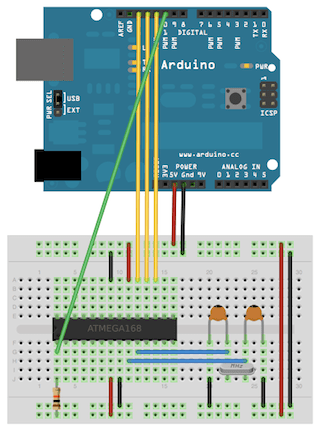 Images are from the Arduino website, and are subject to copyright. Create a bookmark by pressing the star on the right corner of the addressbar. Delete all the text in the Name field, and click OK. 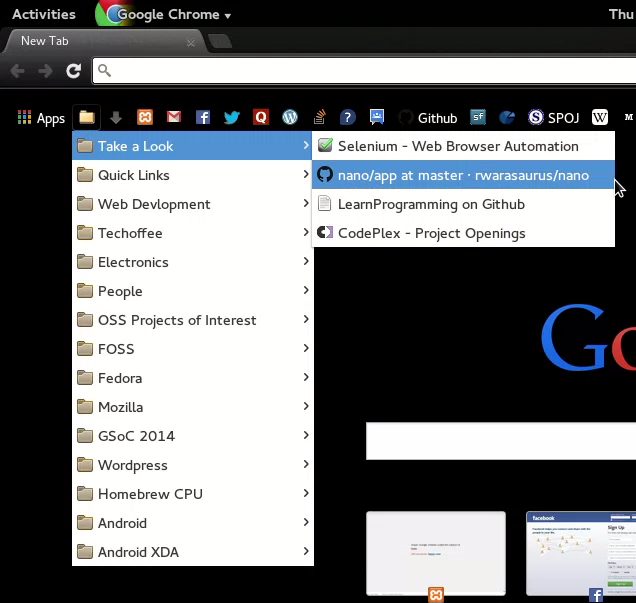 Remember to select the Folder as Bookmarks Bar. 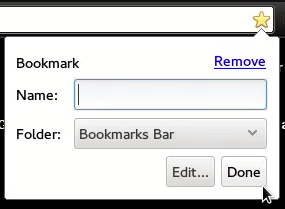 You can even create folders with empty names inside the Bookmarks Bar folder, so that a folder icon appears on it, grouping related bookmarks. I did something similar. First off, I created a folder in the Bookmarks Bar folder, with an empty name. Next, I created several folders for grouping my bookmarks. I named these, and put them inside the folder-with-no-name ( 😛 ). You can create folders too!